Last December, I found a book online about a school shooting. The topic intrigued me. As a teacher, that's my worst nightmare. But I love reading stories about things that scare me. I started reading One Breath Away by Heather Gudenkauf just before bed one night. And then the next day the mass shooting at Sandy Hook Elementary School in Newtown, Connecticut happened. It was surreal to be wrapped up in a fictional story of a gunman in an elementary school while I was watching it happen on CNN. In her most emotionally charged novel to date, New York Times bestselling author Heather Gudenkauf explores the unspoken events that shape a community, the ties between parents and their children and how the fragile normalcy of our everyday life is so easily shattered. In the midst of a sudden spring snowstorm, an unknown man armed with a gun walks into an elementary school classroom. 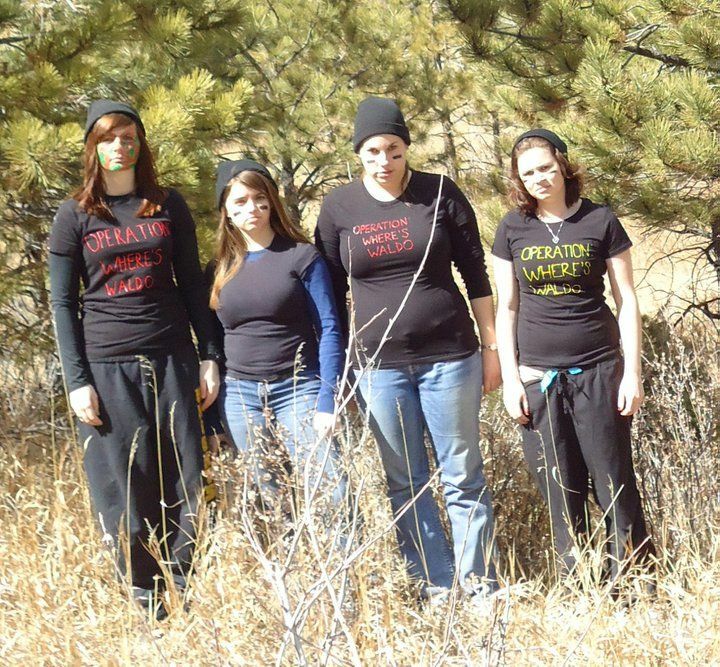 Outside the school, the town of Broken Branch watches and waits. This book gripped me from the very first page. It is told from different perspectives, which is my favorite style of novel to read. It helps me get the whole picture instead of just knowing one person's point of view. I related the most to the teacher in this novel, for obvious reasons. Although I teach middle school, I have a feeling a situation like this would be equally as terrifying. Most people I know would probably not enjoy a book like this -- at least not right now. There have been too many shootings in the USA in recent times, so it hits close to home for many people. However, if curiosity gets the best of you like it did me, check out One Breath Away. 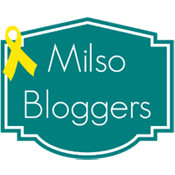 I often see posts bashing the military -- even from military spouses. They aren't bashing the troops, by any means. Some people just talk about how they don't always like the military lifestyle. 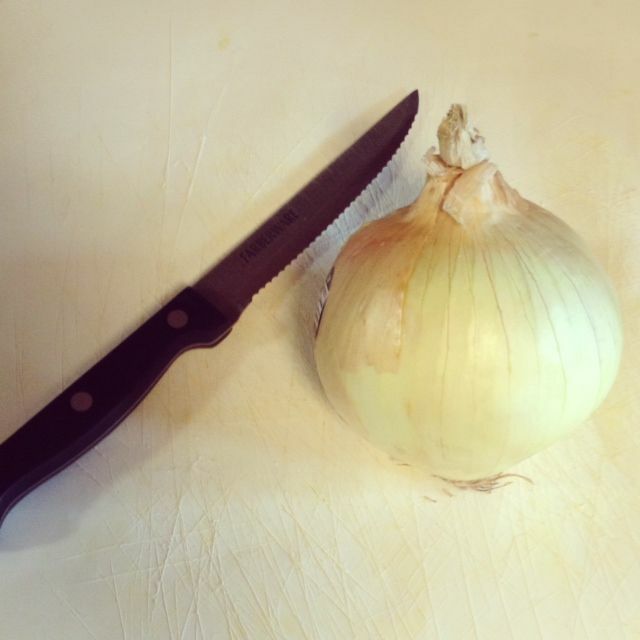 While that is definitely normal, and I have felt that way myself, I want to offer a different perspective today. It's so easy to get caught up in the negative aspects of every part of life. I refuse, however, to let those thoughts dominate my mind. Sure, certain things can be aggravating. 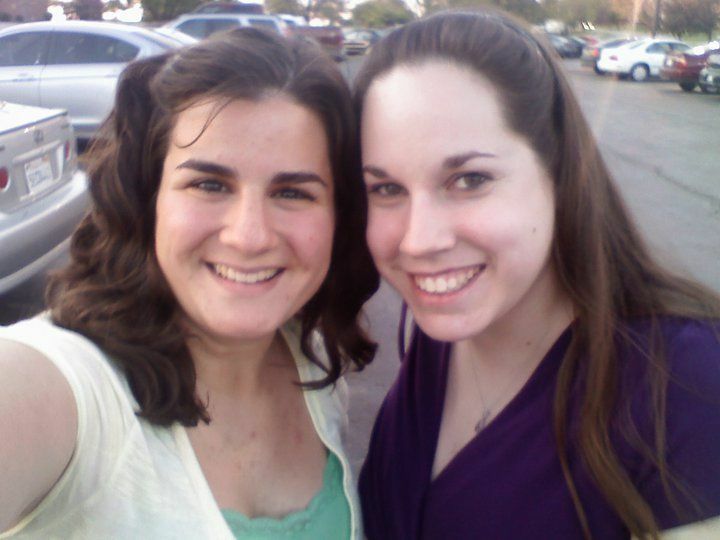 But when I think about it, this military lifestyle that I instantly became a part of when I started dating Dan in 2009 has led me to some amazing friends, one of which I now consider one of my very best friends in the world. 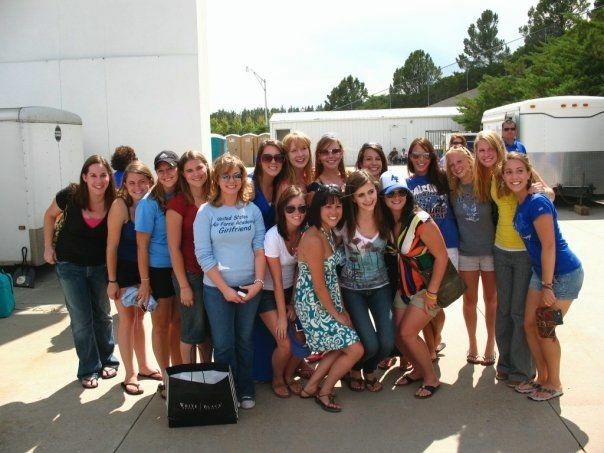 Without the Air Force (particularly the Air Force Academy in Colorado Springs, CO), I wouldn't have met some pretty spectacular ladies. Until the cadets graduate, we aren't allowed to be married. Most of us have been with our significant others for longer than the average dating/engagement timeframe, but we patiently wait for our turns anyway. We ask questions to each other and gain the support we need when we're feeling down. 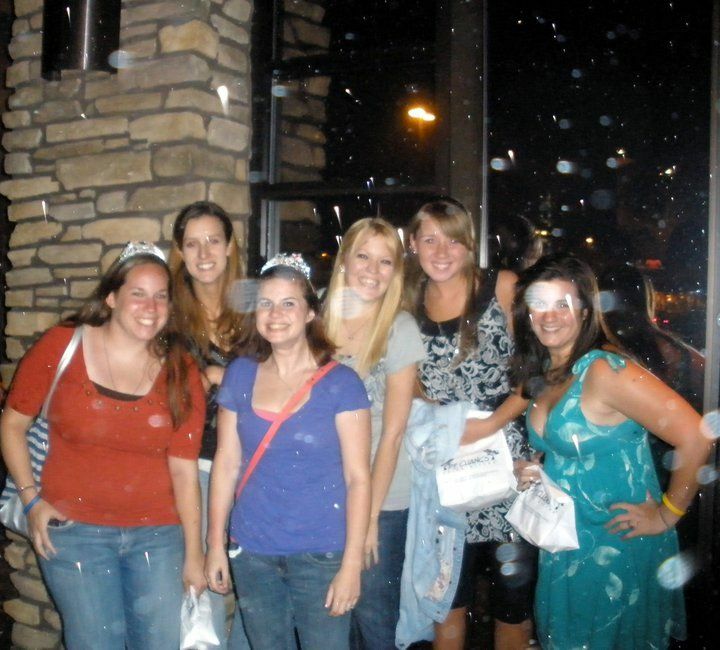 It's amazing how an online Facebook group has brought so many ladies together during a difficult part of life. We were all new at this game once upon a time, and it's so cool to watch people learn and develop through a relationship with a cadet and use their gained knowledge to help younger girls who find us. 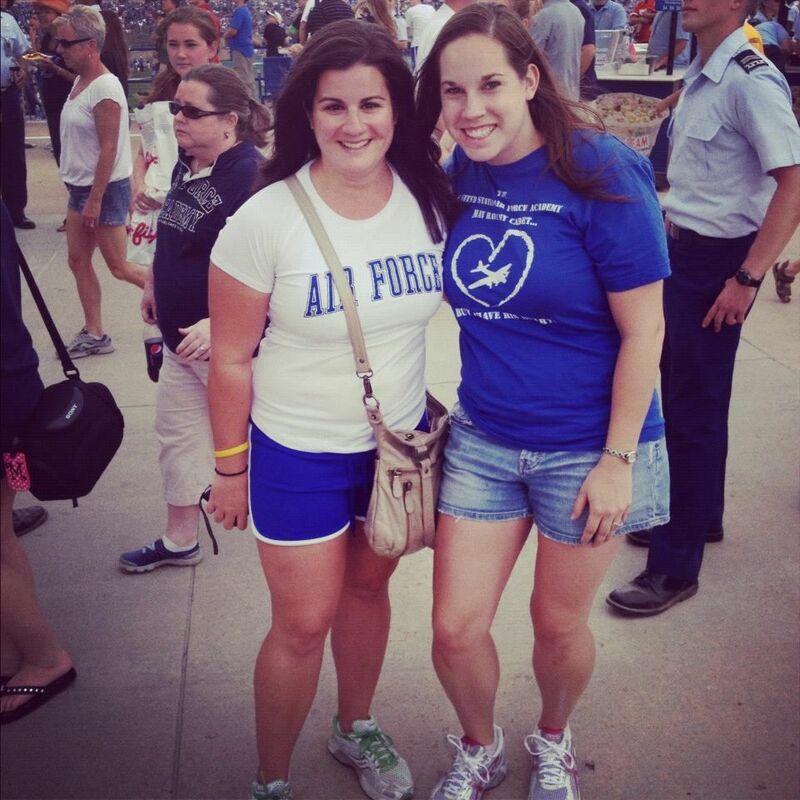 The military (future) spouse community is a special community -- there's no doubt about that! And here are some pictures... but don't worry -- there are comments to go along with each one! 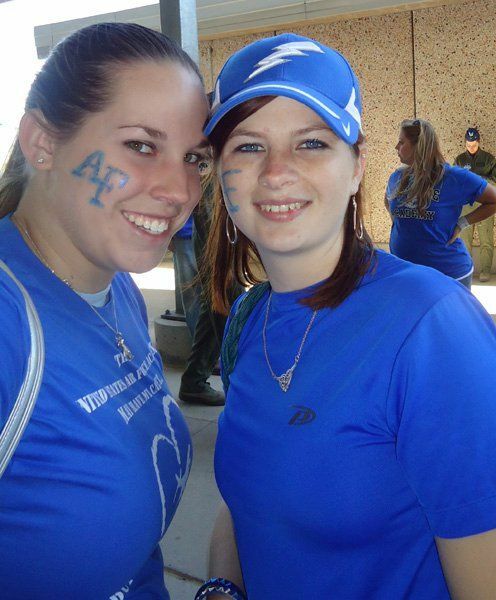 This picture is from USAFA Parents' Weekend in September of 2009 during Dan's year at the Preparatory School. 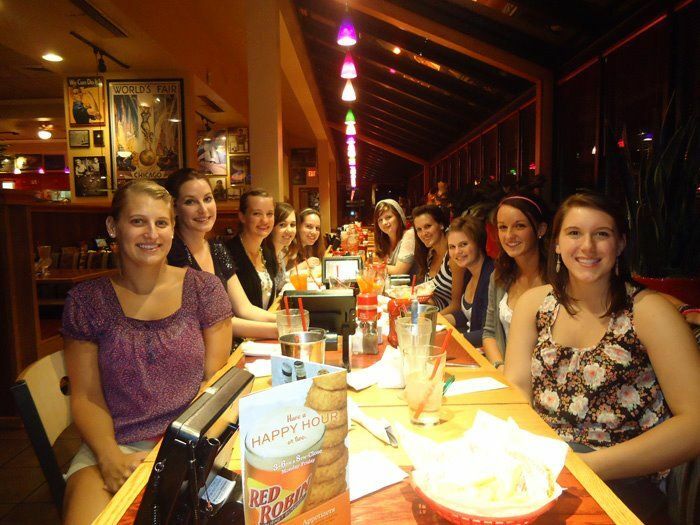 This was my first experience meeting the ladies I had been talking to online all summer, and what a wonderful experience it was! When Lizzie and I realized we were going to school about an hour and a half away from each other, we decided to meet up for dinner. It was so much fun, and we instantly got along really well. 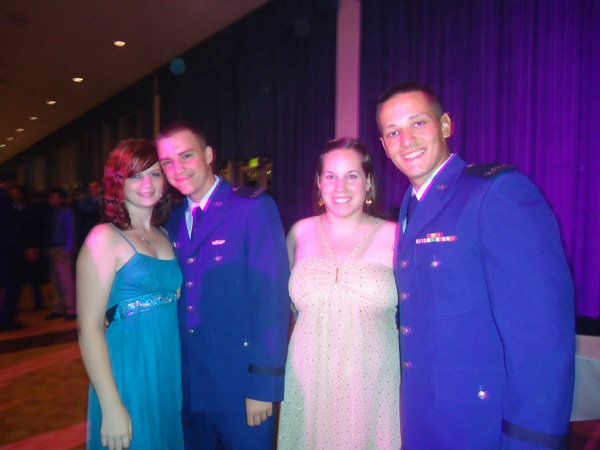 We still talk daily (almost four years after "meeting" each other), and I honestly believe we would be close friends even without the Air Force connection we have. I just thank whatever military powers that may be for allowing us to meet! When I had JUST moved to Colorado Springs after a year of long distance dating, Dan was in his third Basic Training, and I knew hardly anyone. These lovely ladies came to a birthday dinner for Ellie and me, and it was SO nice having that when I didn't have friends out here yet. 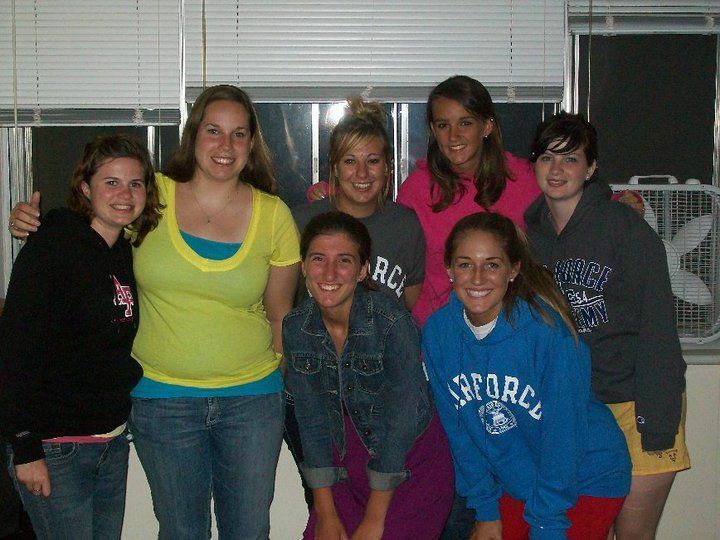 The night before the freshman cadets (class of 2014 at USAFA) had their Acceptance Day, a group of girlfriends got together. We had been talking ALL summer while our boyfriends were in BAsic Training, so it was wonderful meeting them and hanging out with them! 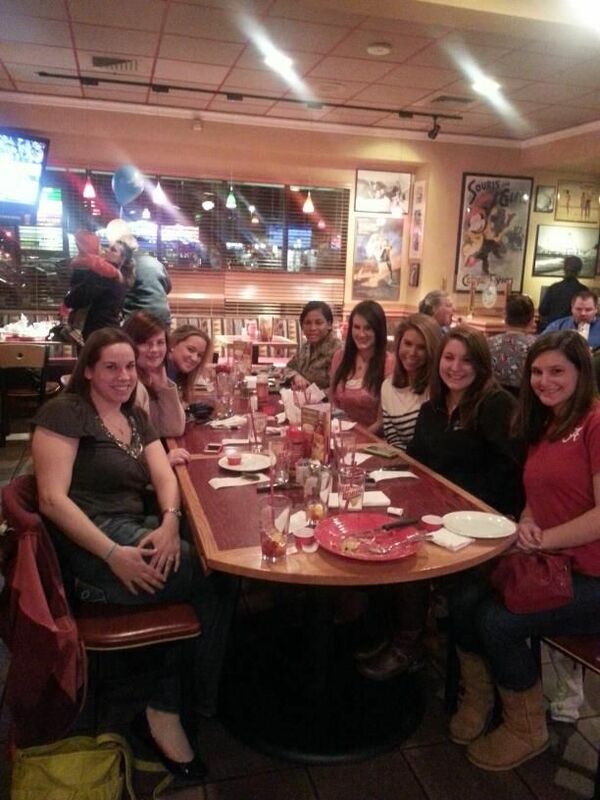 Every Thursday night before Parents' Weekend begins, all of the girlfriends of cadets who are in town meet up for dinner in Colorado Springs without cadets or families. We always have SUCH a great time. This picture was taken when Dan was a freshman at the Academy. 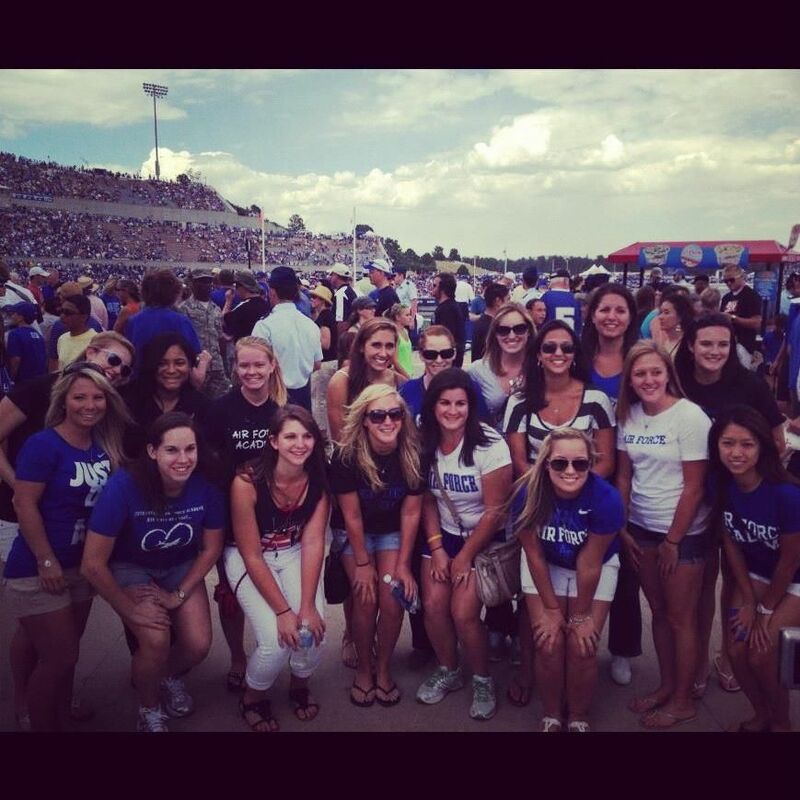 During halftime of the football game during USAFA Parents' Weekend, the girlfriends always get together to take a picture in Falcon Stadium on base. It's really great meeting new people each time! 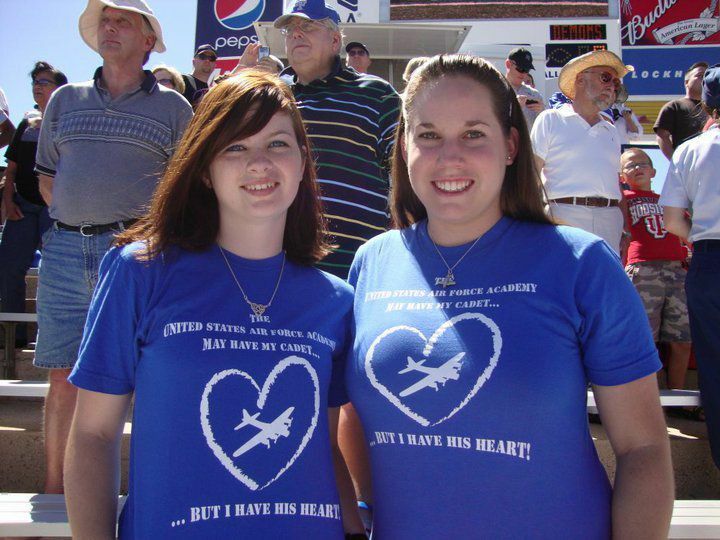 I designed shirts for some of the girlfriends to buy, and Emily and I wore them to the football games! 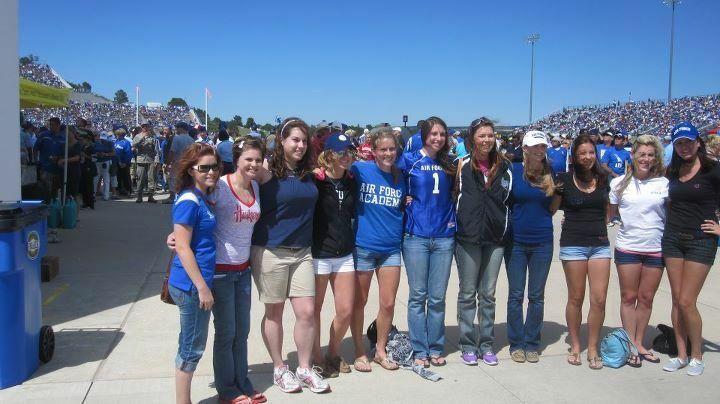 When our boyfriends (now fiancés) were freshmen, Emily and I were football game buddies almost every week! It was a lot of fun. 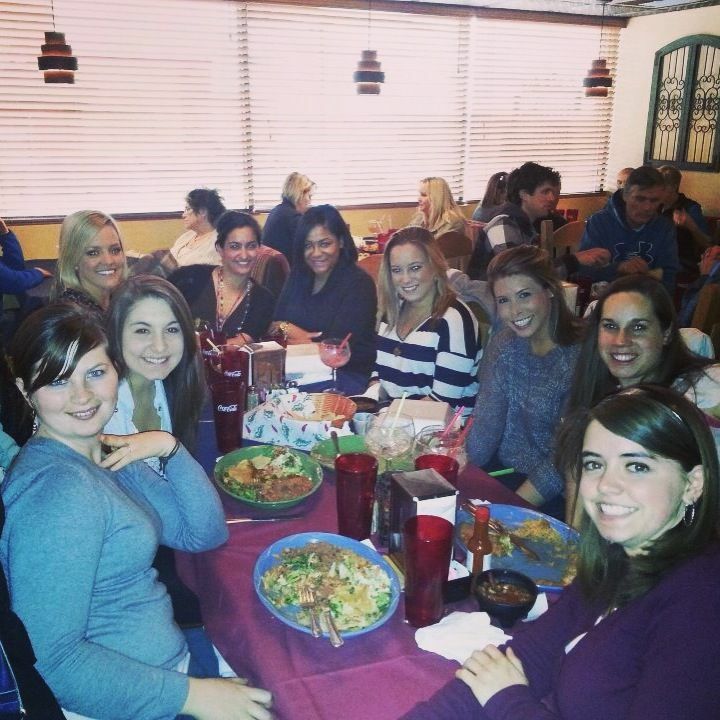 It is also always fun when you get to hang out with former cadets' wives! Kate is so much fun! Ellie and I also got pretty close while she lived out here. It was so hard saying goodbye to her when her husband was stationed elsewhere after graduation, but luckily we keep in touch. The balls are also more fun when you have other friends there! 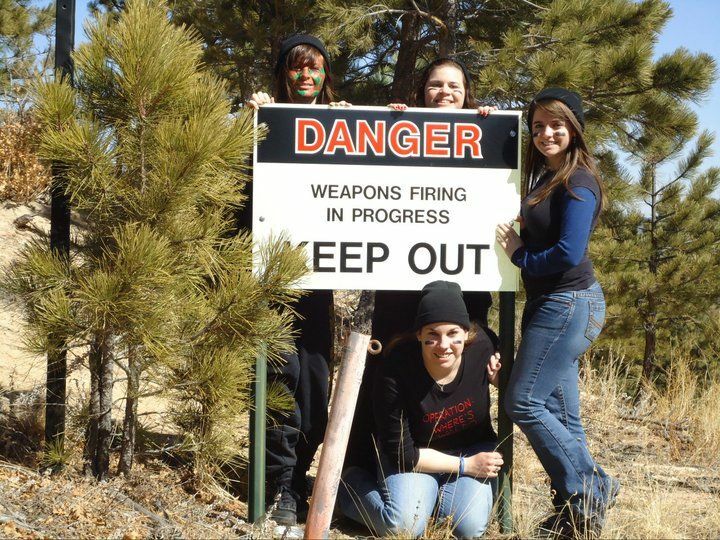 Don't mess with future military spouses! Ha! 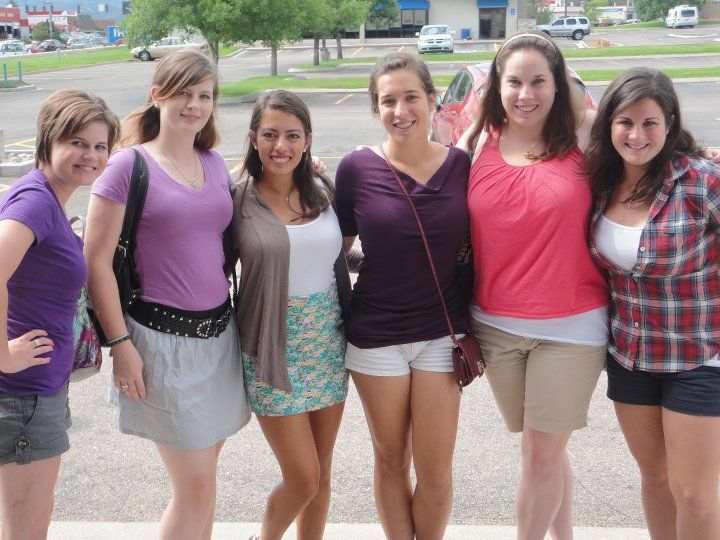 A lot of girls were in town at the same time in 2011, so we met for lunch! This is from dinner before Parents' Weekend in 2011, Dan's sophomore year at the Academy. This is the Parents' Weekend football game in 2011, and I think this is one of the smallest turn-outs ever. 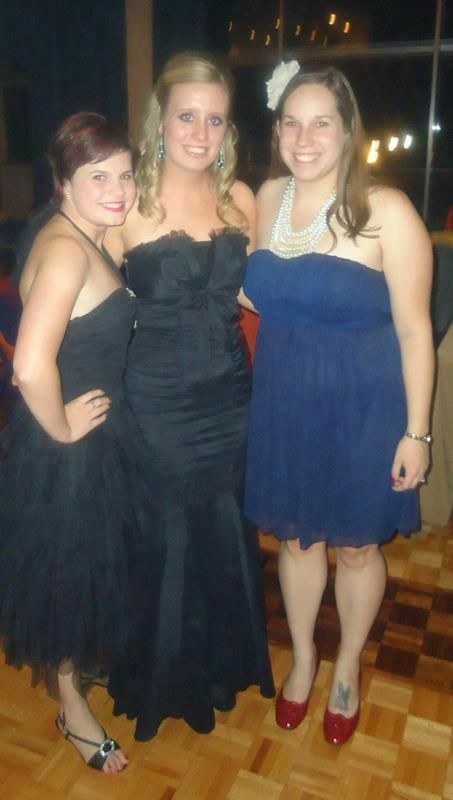 This is Ellie, Torie, and me at the Air Force Academy's Autumn Ball in 2011. 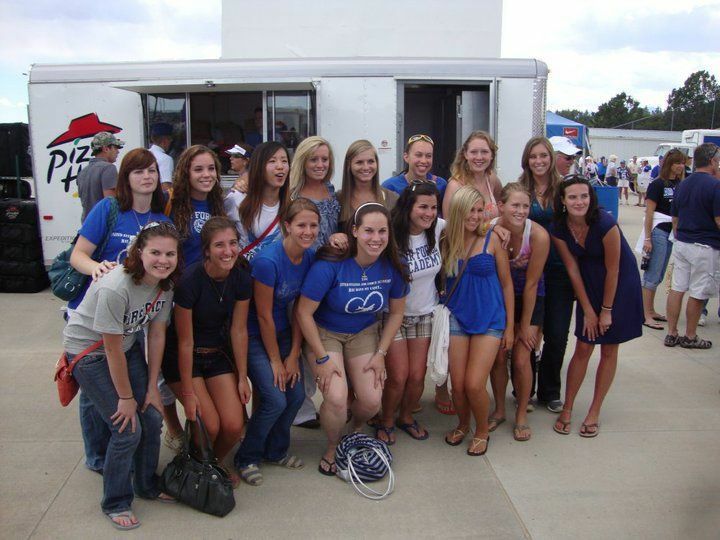 We had a great turn-out for the halftime meetup during Parents' Weekend in 2012, Dan's junior year at USAFA! 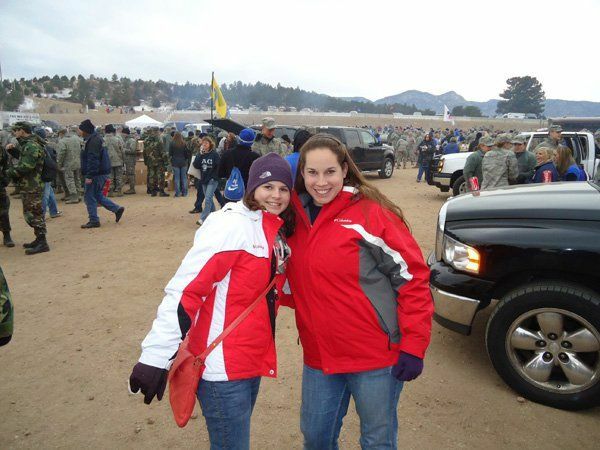 Lizzie and me at the football game -- we have way too much fun together! 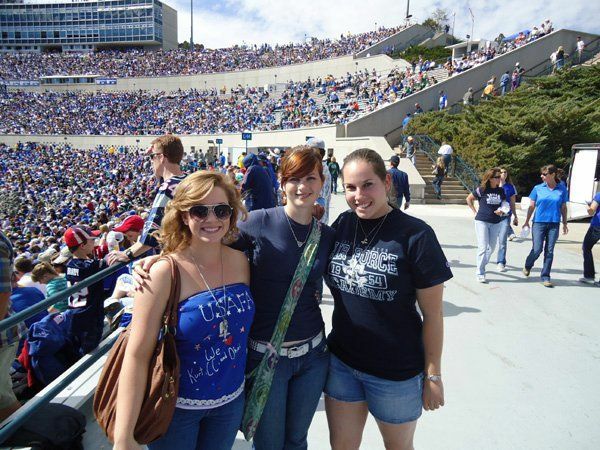 Torie, Lizzie, and I had matching strawberry daiquiris at a dinner before the Air Force v. Navy football weekend in 2012. 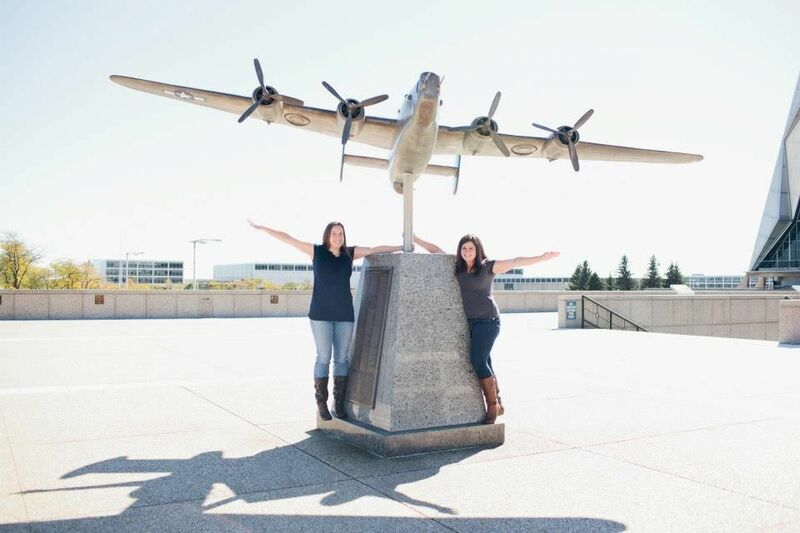 Dan and I had professional pictures taken at the same time as Lizzie and her fiancé at the end of the Air Force v. Navy weekend in 2012 by another USAFA girlfriend, who happens to be a photographer! It was so much fun, and Lizzie and I could NOT resist taking some silly pictures together at the Academy! 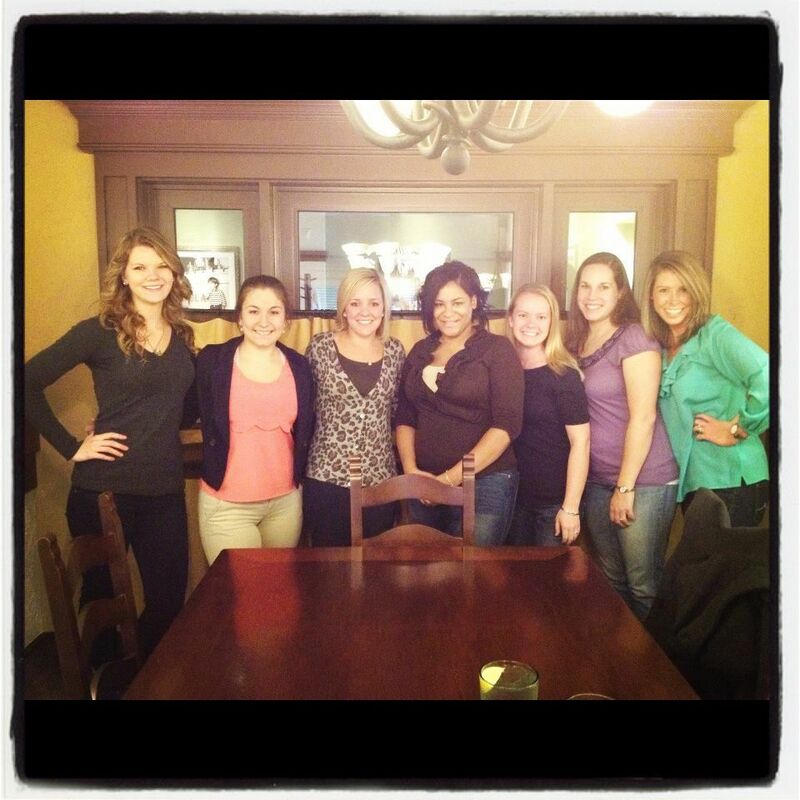 A small group of USAFA girlfriends went to Olive Garden in the fall of 2012, and we had so much fun talking and catching up. 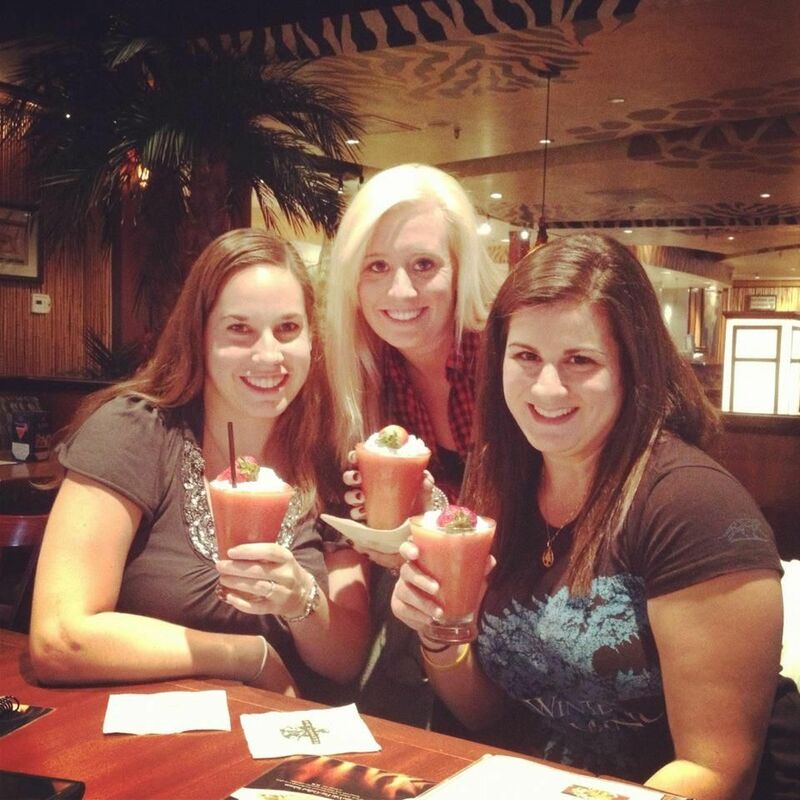 Our waiter was way too friendly, but it was hilarious! 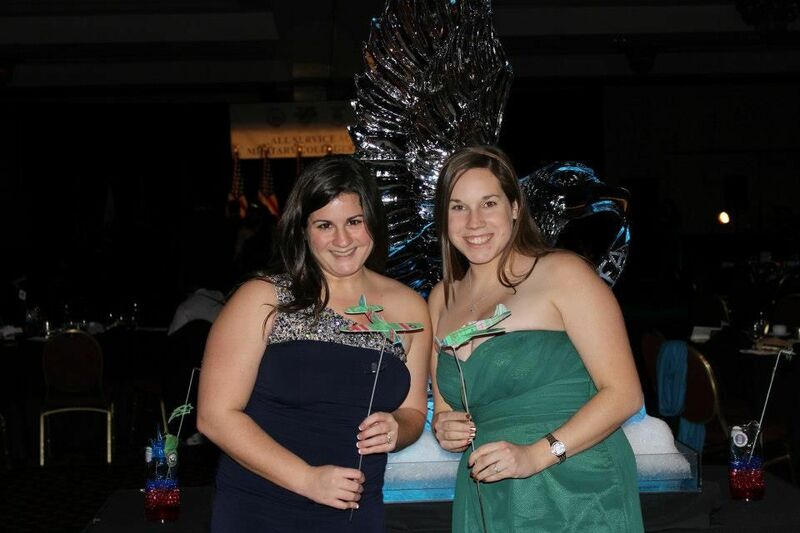 When our fiancés went to the restroom, Lizzie and I had too much fun posing with foam airplanes at the All Service Academies Ball in Kansas City, MO at the end of December! One of the wives of a USAFA grad moved away in early 2013, so we all got together for dinner one last time before she left for their new home. As always, it was lots of fun! Some of who live in Colorado decided we should get together because it had been a while, so we did and ended up talking our heads off for almost three hours. It was a blast! This was in April of 2013. 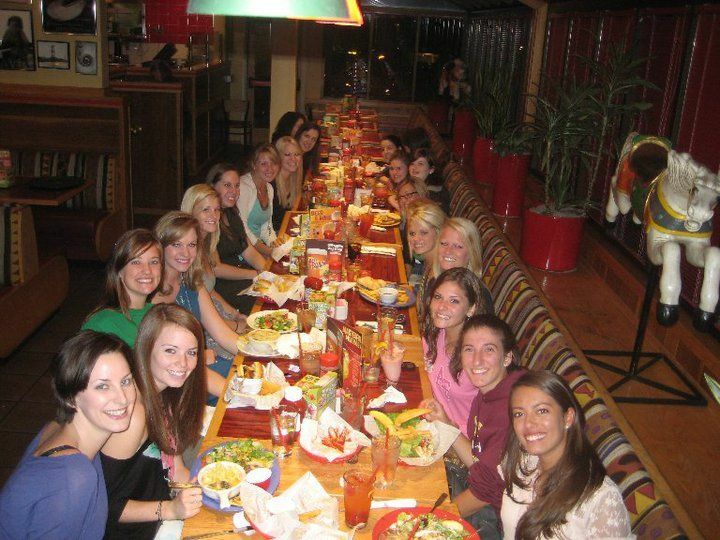 Can you believe that ALL of these friendships (plus hundreds more) have formed from one little Facebook group? It's such a strange thought, but technology really is a miracle for many people these days, with military significant others being no exception. 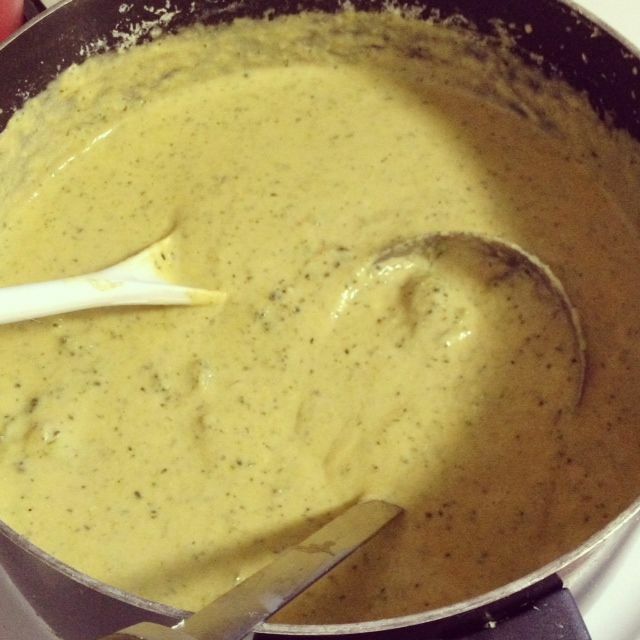 If you love Panera's broccoli and cheese soup, you'll love this one. 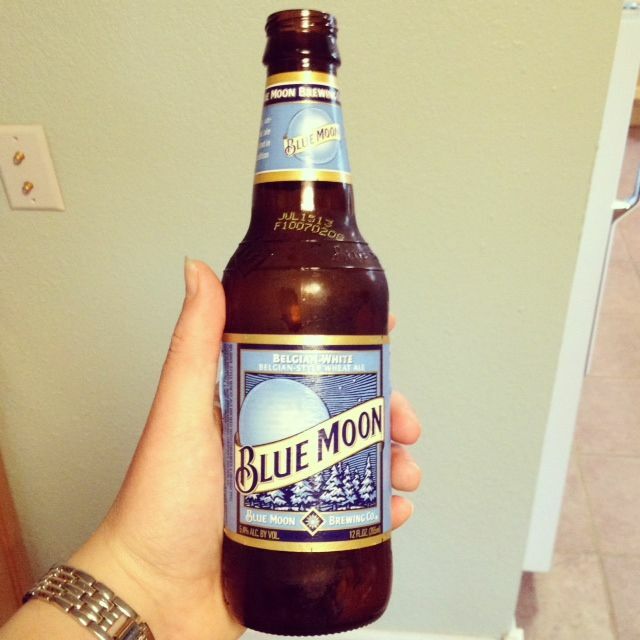 It's a bit heartier (and full of even more veggies), but it's got the same great taste! 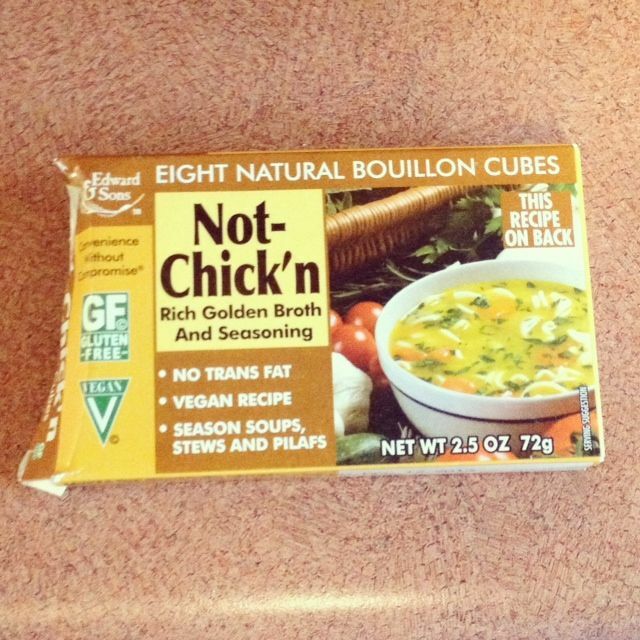 Okay, so the name of this recipe is misleading. It should really be called "broccoli, carrot, cauliflower, onion, beer, and cheese soup"... but that is too much of a mouthful, so I condensed it. 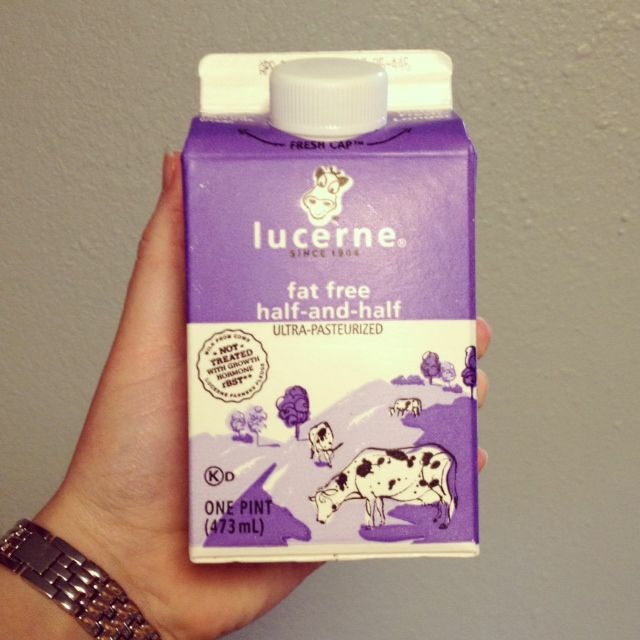 Just know that all of those wonderful things are inside this delicious concoction. You WILL want a mouthful of it! 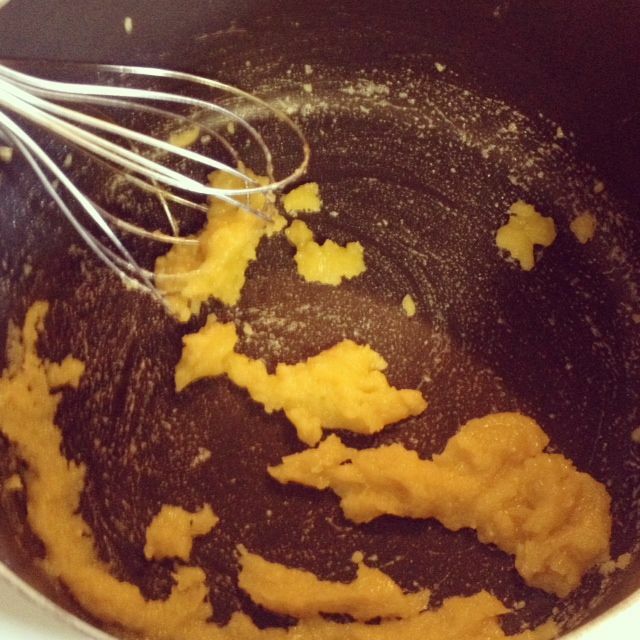 Check out the pictures first, and then find the ingredients and recipe written below! ENJOY! 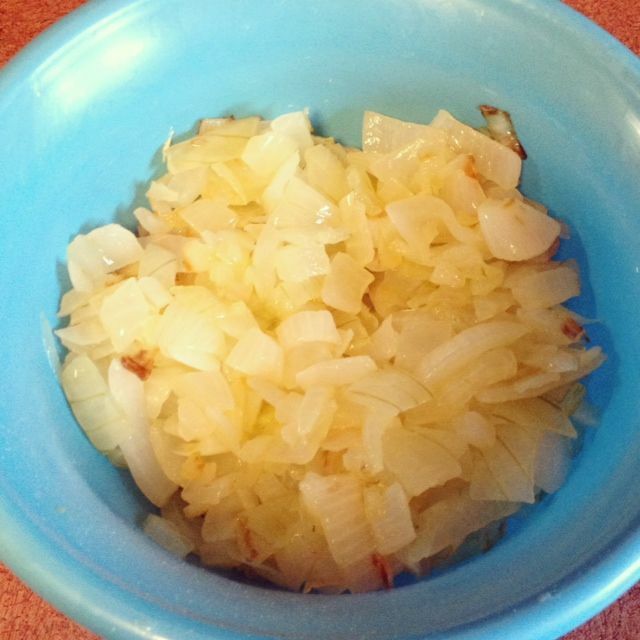 Sautée the onion in 1 tablespoon of butter. Set aside. 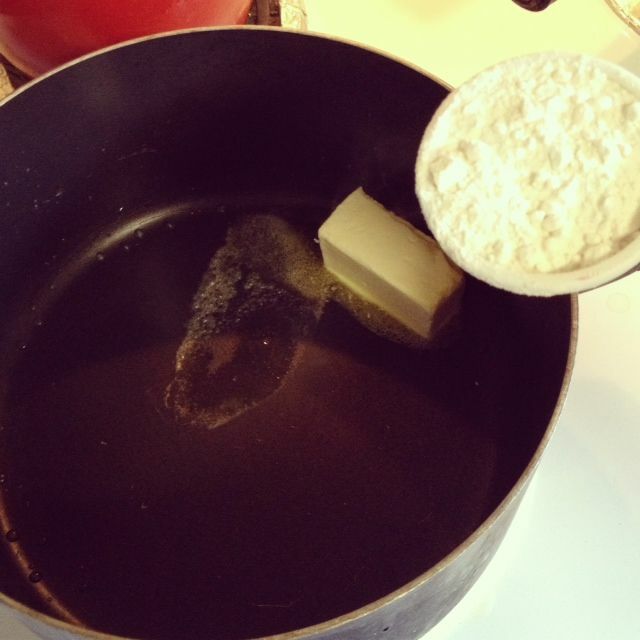 Cook 1/4 cup melted butter with 1/4 cup flour over medium heat for three minutes. 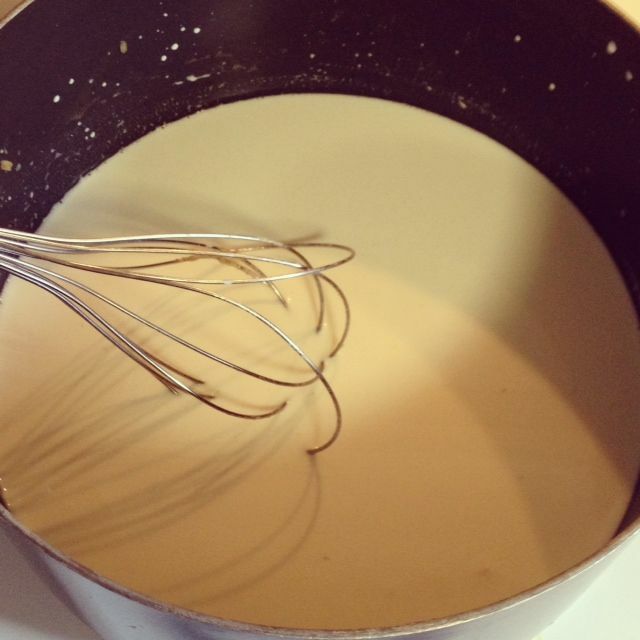 Stir constantly with a wire whisk constantly. Add the bottle of beer. 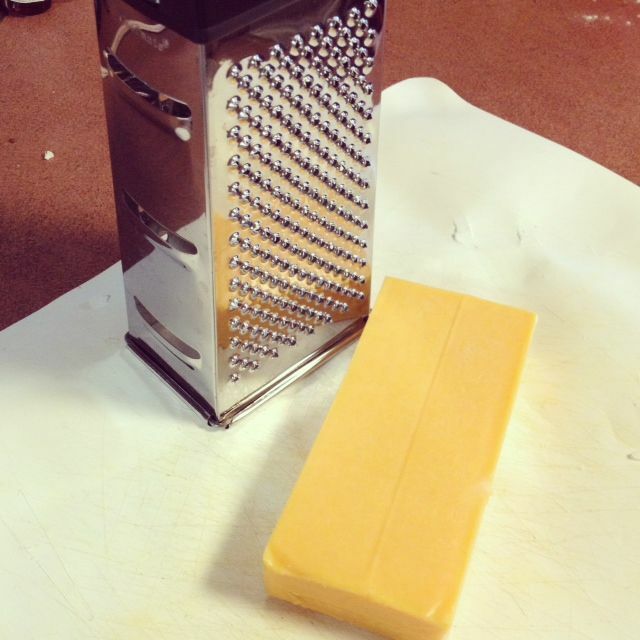 While the soup is simmering, grate the cheddar cheese so it's ready to go. 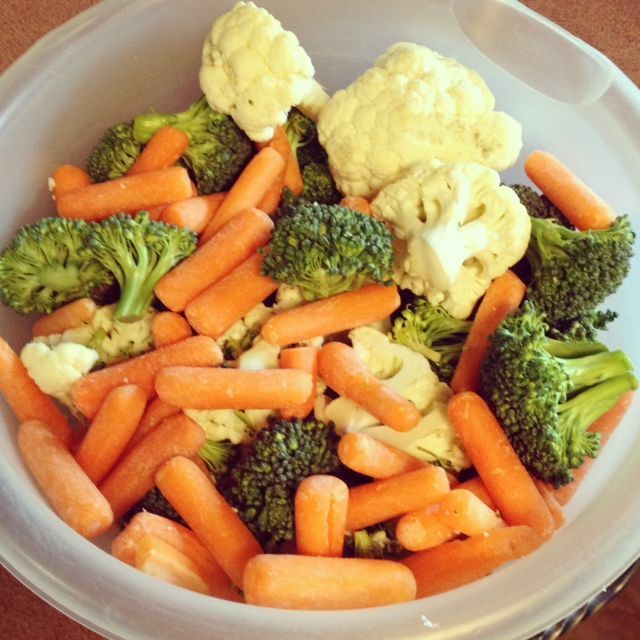 Add the onion, broccoli, cauliflower, and carrots. 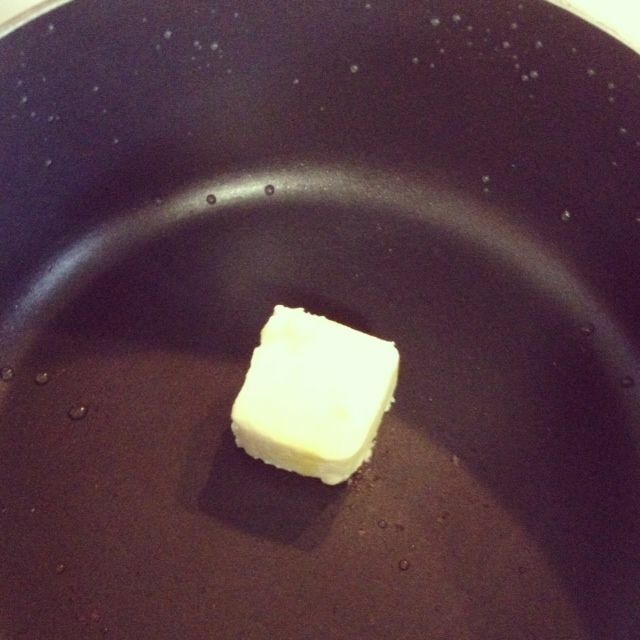 Cook on low heat for 25 minutes. Return to saucepan on stove. 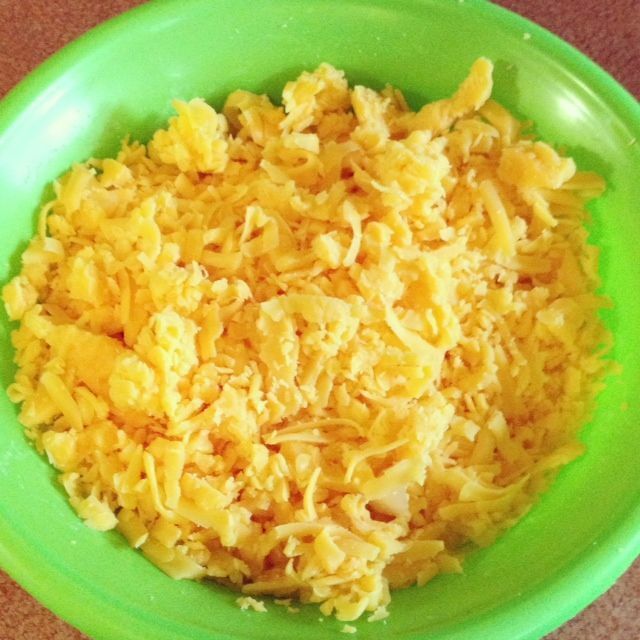 Add grated cheddar cheese. Stir it until it melts. 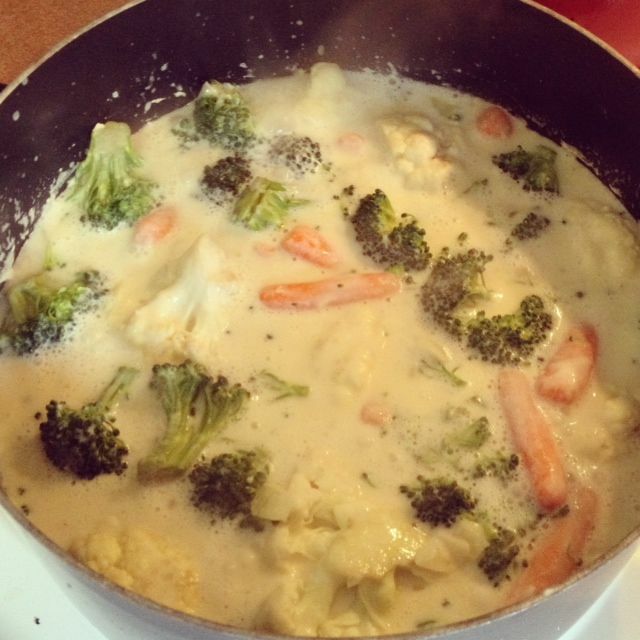 *I take out several broccoli florets at this step and add them back in after the rest is blended so there are still some chunks of broccoli in the soup. I do this for Dan because he prefers it, but you don't have to. 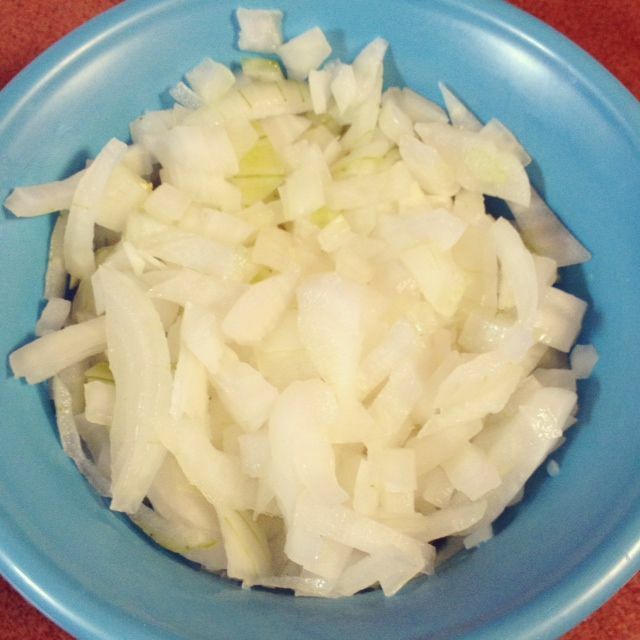 You could also leave some of each veggie out if you prefer. Today is a very special day. Someone I love very much turns another year older today. Any guesses? That's right -- my incredible, wonderful, supportive, amazing, super-handsome fiancé turns 24 today! But in all seriousness, he is my rock, and I am SO happy to have spent his 20th, 21st, 22nd, 23rd, and now 24th birthday with him! I didn't make something for Dan for once... it's surprising to even me! I actually bought him a gift. At a store. A real store. Isn't that crazy?! He's going to be shocked only because he has received nothing but homemade things for a long while. Oops. Also, one of my students has a strange infatuation with Dan. She loves writing letters to him, and she gets SO excited when he writes back to her. I told her this morning that it was his birthday. She asked how old he would be, so I told her 24. At the end of the day, she brought me a giant card she had made for him. I blurred out her last name and some of the personal part! Earlier, I wrote this post before I met up with Dan... here's a picture of the birthday boy with his celebratory ice cream at Texas Roadhouse!